WordPress 2.8 was released a day before, i’m sure most of you want to upgrade to the latest version of wordpress. Here are the instructions on upgrading to wordpress2.8 with out any downtime or hastle. You can update from your dashboard directly like you install a plugin, It’s very simple. WordPress is gettting better day by day and the improvement is exponential 🙂 . Follow the below instructions if this doesnt work for you. Before anything backup your wordpress database. Replace the above deleted files with the files from wordpress2.8. Here are some common mistakes done by bloggers while upgrading. Deleting all the wordpress installation folder. 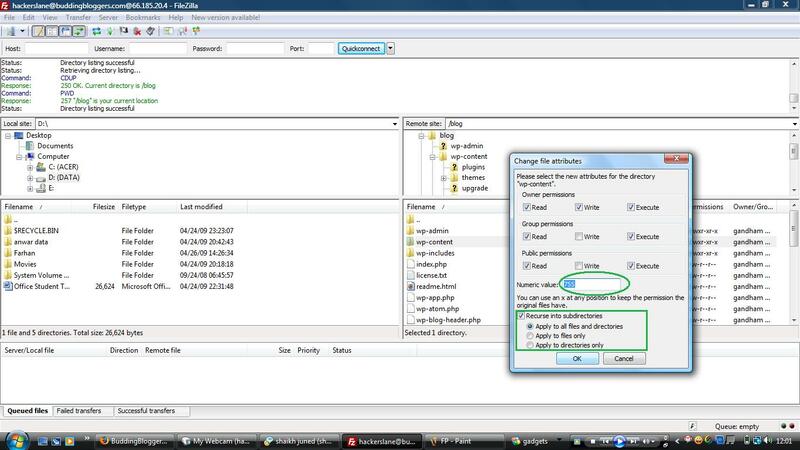 This way you will loose your wp-content folder, where your themes,plugins and the uploaded files are stored. You need not upgrade this folder. So dont ever delete it. Are you looking for your posts in the installation folder?? They can not be found there, they are stored in your sql database. In order to backup your posts you have to backup your database. You will not loose your posts if you delete your wordpress install directry or mess with it. So dont worry as long as your database is safe and you have its details. File Permissions affect the capability of users or group of users to Read, Write or Execute files. They define who or what can read , write or execute the files or directories. 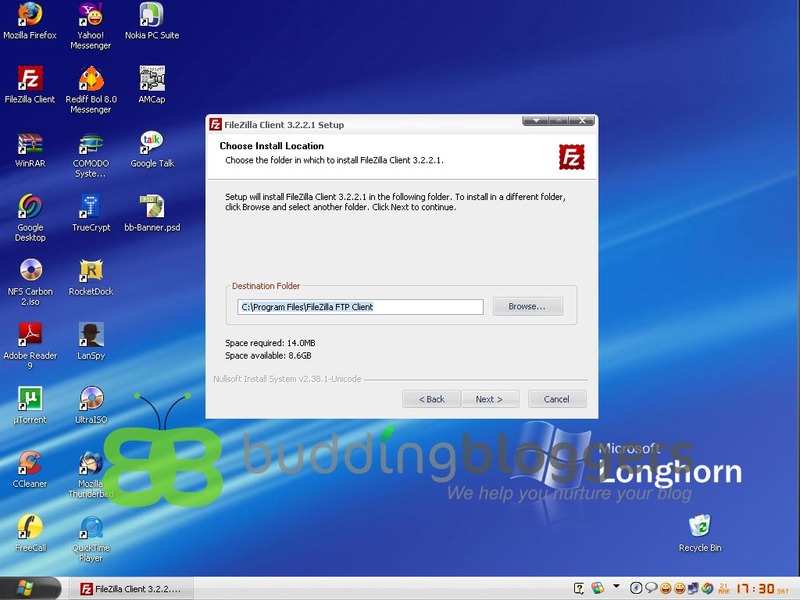 The File Permissions can be easily changed by using FTP Clients such as FileZilla. Install and configure FileZilla, if you haven’t done it yet. 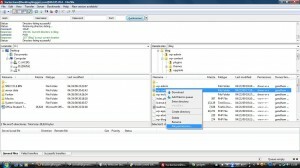 Open FileZilla and browse to the directory/file, of which you want to change the File Permissions. An interface would pop-up asking for the required File Permissions. Fill the box with the required File Permissions. If you are changing the File Permissions of a directory, choose the option “Recurse into Subdirectories“and then select the preferred sub-options. Then click “OK“. You can see the status of the process of changing File Permissions in the Status Bar on top. Here, I’m just showing how to use the command line to change the FPs of a single file, there are some extra commands that are used to recurse FPs into subdirectories. Run FileZilla and connect to your server. A dialogue box would pop-up asking for the FTP Command. Click “OK” and you would get a message in the top Status bar informing that the command was a success. SEO (Search Engine Optimization) is a must to-do if you want to drive a lot of traffic to your blog. Fill up the Site Submission Form over here. On the next step you may need to confirm the ownership of your site, either by uploading a page to your site or adding a meta tag to your site. After your confirmation, just wait for the bots to index your site. In the mean time you can do some link exchange with some sites with a higher PR (Page Rank) than yours. Its recommended to exchange links with a site with higher than PR3. Link exchange will help you to get traffic and also in the index progress as the Bots will visit these higher PR rank sites and when they find your link over there, they will index it. Use social bookmarking sites such as StumbleUpon, Digg. Doing these will help you increase your popularity. Submit your site Here. Make sure you are logged-in to Yahoo before submitting the URL, or else it you can log-in to yahoo after entering the URL. If you want to do some investment for your site on Yahoo, you can select from the plans that appear after the URL submission. In the mean time you can do some link exchange with some sites with a higher popularity than yours. Link exchange will help you to get traffic and also in the index progress as the Yahoo Bots will visit these higher popularity sites and when they find your link over there, they will index it. Submit your site Here. Make sure to fill the Captcha before submitting. That’s it…wait for the MSNBots to do their work. In the mean time you can do some link exchange with some sites with a higher popularity than yours. Link exchange will help you to get traffic and also in the index progress as the MSNBots will visit these higher popularity sites and when they find your link over there, they will index it. There’s no specific way to submit your site to Ask. Ask doesn’t offer any site submission ways for free. But the Bot at Ask does crawl the web and it automatically adds pages. And being in DMOZ helps in fast submission to Ask. Security of a blog is the major component of blog management. By securing your blog, you mean that your blog is safe from intrusion by hackers and other badmen who want to intrude into your blog and put some malicious content on your Blog. Security should be the major cause of concern for the blog owners who run a blog that recieves a good traffic and is popular, because such sites have more chances to be targeted. Check if your WP is of the latest released version. Always upgrade to the latest version available, as the new releases are more secure and bug-fixed. Choose a secure password, using atleast one special character and/or numbers. Assign only the required File Permission for any file, not more than the required FP. More details on FPs can be found here. And lastly, implement some Security Plugins on your Blog. It acts like a Firewall for your blog. It blocks the most obvious attacks. WP Firewall can block directory traversals, SQL queries, WordPress specific terms, field truncation attacks, leading in application parameters. It can also block the uploads of executable files such as .exe, .php, etc. It records the IP Address and Timestap of the failed login attempts. If more than 3 failed login attempts are done within 5 minutes from the same IP, then the login function is disabled for all requests from that IP Address. This helps to overcome Bruteforce attacks. It scans your WP for vulnerabilities and gives suggestions to correct the vulnerabilities. It also offers to change the table prefix (wp_) easily to some other prefix. This plugin protects your whole wp-admin with a password. This helps to prevent unskilled, newbie hackers from attacking your blog with some special vulnerabilities. This post is written targeting the budding bloggers participants, all the points except 1,3 are applicable to any general blog. Save your ftp login details carefully. Backup the wp-config file in the blog directory. Create a administrator account for your self from the temporary administrator account we provide, and delete the temporary administrator account. Go to the settings -> General panel. A sanitized version of the tag name (tag slug field on New/Edit Tag panel). Delete the hello world post or update it with your blog intro. The most addictive thing for bloggers are stats, the daily raise in your stats gives you the motivation to deliver your best. The best stats plugin available for wordpres is WordPress.Com stats http://wordpress.org/extend/plugins/stats/ . Install the akisment spam plugin, both akisment and wordpress.com stats plugin require the api key, I will explain how to get a api key in mynext post. FTP clients are softwares used for managing files on the server, using FTP (File Transfer Protocol). This is the most common method to uplaod files on to your webserver. Go Here and click “Download FireFTP”. A banner would appear on top asking to install it. Click “Allow”. After the installation, restart Firefox and check in the “Tools” in the menubar. There will be a new icon “FireFTP”. Click it and a new tab would open. In the “Account Manager”, fill up all the settings. Your FireFTP is ready to use now. The left-column shows your PC and the right-column shows your Domain. Your blog would be installed in the “/blog/” directory by default. Right-click on the file to be uploaded and click “Upload” or else you can “Drag & Drop” the fileto be uploaded to the destination loacation. Make sure you are uploading things in correct directory. For example, the theme should go to Root:/blog/wp-content/themes/ and for plugins it should go to Root:/blog/wp-content/plugins/. The transfer status would appear in the bottom-column. FileZilla is one of the most popular FTP Clients. It is easy to use and very reliable. Run the Setup file. Agree the license agreement. Select your settings & select the installation folder. After the Setup is finished, Run FileZilla. On the Menubar, go to File\Site Manager. Click on “New site” option on the left. Fill up the settings; the Host, port, User, Password,etc. Tips to choose a theme for your wordpress powered blog.